The Coach House is situated on the grounds of Brian Royd Hall in the Calderdale Valley, Greetland, near Halifax. 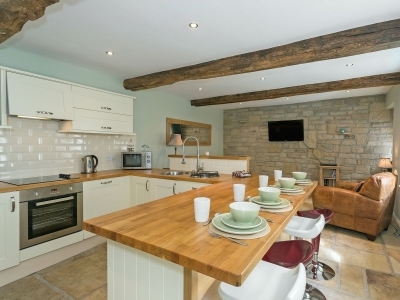 It is a detached former coach house which retains many original features after a tasteful refurbishment. Modern luxuries include underfloor heating. The property enjoys amazing views across the surrounding West Yorkshire countryside and is adjacent to the owners' home. There are plenty of restaurants, pubs and shops close by in the villages of Ripponden, Barkisland and Greetland. Golf lovers are also well catered for with a choice of nearby golf courses. The nearest train station is just 2 miles away, Sowerby Bridge on the Calderdale railway line. It passes through several local villages and towns including Halifax and Hebden Bridge, as well as the larger tourist attractions of Leeds and Manchester. The nearest pub is only 1/2 mile away and the nearest shops and restaurants just 1 mile.